Glamping is a way of life, it’s an attitude! 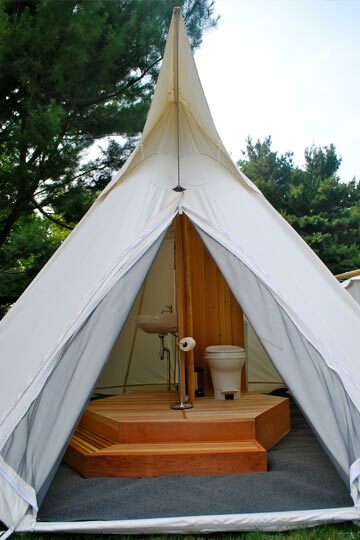 Glamping is defined as “Glamorous camping. Satisfying your craving for the outdoors and your penchant for a good meal, nice glass of wine, and a comfortable bed”. You can glamp in an Airstream or you can glamp in a luxurious safari tent while feeling like you have just stepped onto the movie set of “Out of Africa”! 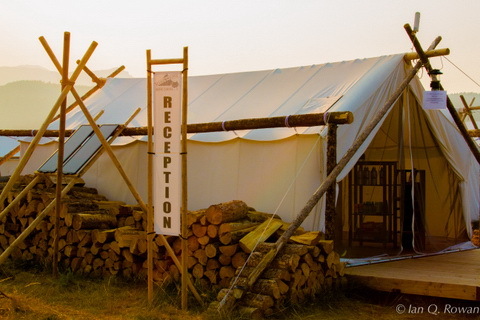 Welcome Yellowstone Under Canvas, an uber glamorous glamping experience! Imagine the serenity and overall peace while sleeping under the stars in West Yellowstone. Dine in the Bar N Restaurant, raft the Gallatin River or try your hand at fly fishing in the Yellowstone River. Bonus, you can park your Airstream on property while Glamping in one of Yellowstone Under Canvas’ cozy tents or tipi’s. I have just added Yellowstone Under Canvas to my bucket list, for sure!!! “There’s something unique about life under canvas. Under a canvas canopy, space is light and open. The barrier between interior and exterior feels less definitive. As a result, the possibilities to arrange the space become as infinite as the landscape backdrop. 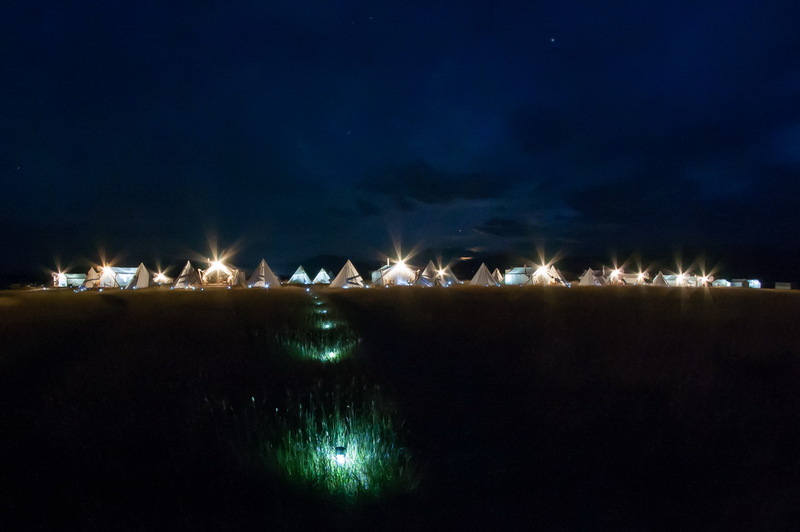 With the Under Canvas experience, glamorous tipis and safari tents can fit seamlessly into the scenery or stand as a tent village, striking against the sky. 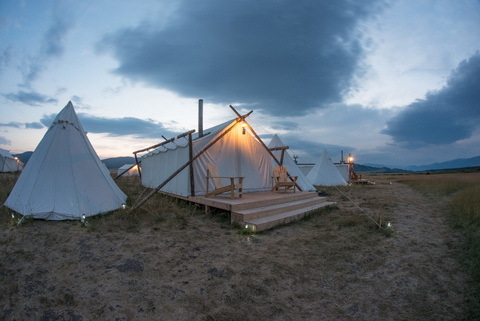 Sage Safaris was started by a husband and wife team and now includes two branches: the Yellowstone Under Canvas luxury camp on the edge of Yellowstone National Park, and Under Canvas Events which brings the glamping experience to weddings, corporate retreats and festivals all around the US and in some parts of Canada. On the Under Canvas Events side of things, weekend glamping weddings are a rising trend. Especially in destination locales like here in Southwest Montana, (and I’ve heard, coastal California and the Pacific Northwest), brides and grooms are crafting weddings that double as a weekend vacation for their guests. What’s the best way to keep the party going and allow your guests to thoroughly experience a fishing, hiking, outdoor mecca where your event is located? Host your guests right on site, glamping in shelters that are luxurious and connect party goers with the great expanse of landscape around them. 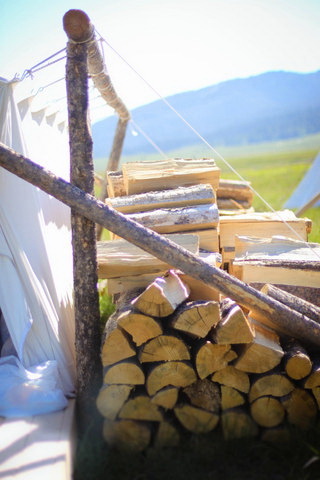 Our tents have been used for accommodations, lounge spaces or large gathering areas – topped off with the indulgences of atmospheric central fires, wood stoves, rolltop baths, and hot water showers. You won’t find luxury tents like ours anywhere in the U.S. 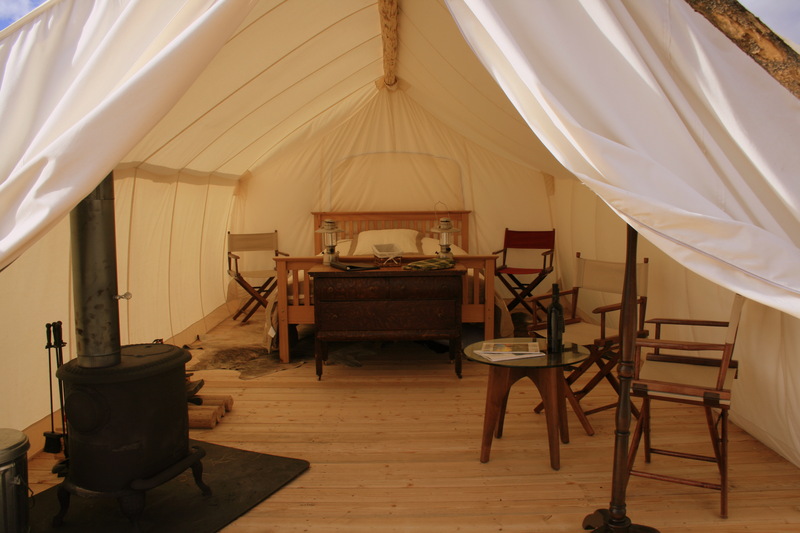 The Yellowstone Under Canvas luxury camp in Yellowstone is one possible glamping experience we can bring to your own event. The luxury camp is located 10 min from the western entrance of Yellowstone National Park, and about 35 min from Old Faithful geyser. And, yes! you are welcome to park your RV or airstream in the parking lot as you rejuvenate your road weary self with some decadent safari tent or tipi glamping. 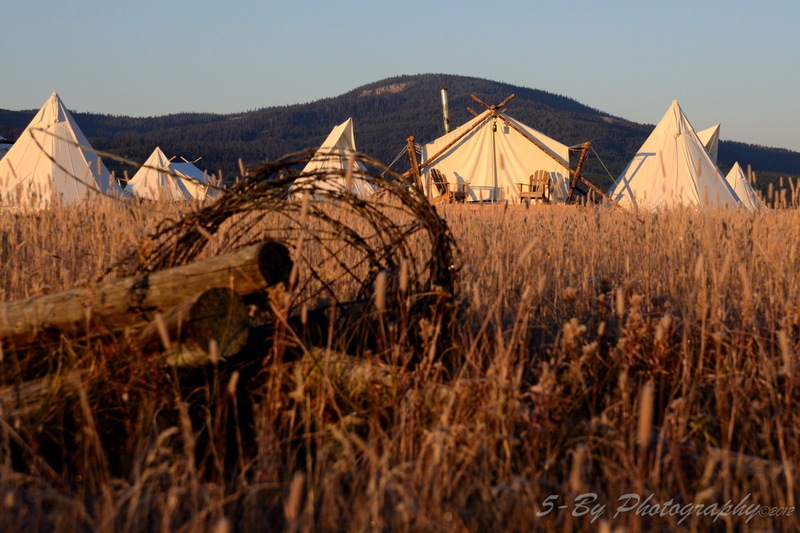 Made up of 35 tents, Yellowstone Under Canvas can accommodate about 130 people at one time. We share the site with the Bar ‘N Ranch restaurant that offers fine dining for breakfast and dinner. Guests can then special order picnic lunches or a sundowners, drinks and appetizers alongside the river, from us or find lunch in nearby W Yellowstone. We offer honeymoon and active family packages and can help you book activities including national park, guided hiking, horseback riding, fly-fishing or ATV tours. Kayaks and stand up paddle boards can now be rented at camp. Imagine stepping from the door of your tent right onto the river. Our team is here to help you organize the most memorable vacation with all the highlights of the Yellowstone region. 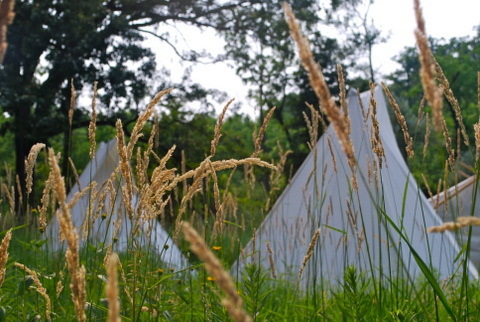 Our tipis and deluxe safari tents complete the glamping experience. Tipi bathrooms are a decadent experience in themselves with all the amenities mentioned above, plus ceramic flush toilets and spa products. 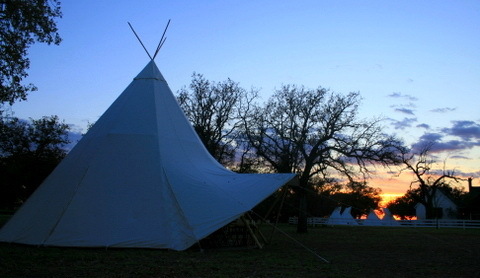 If you have kids, tipis that sleep 4 can always be added adjacent to your safari tent. Brand new this summer we will have 3 Deluxe Suites. This means: soaking in a rolltop bath on the edge of Yellowstone National Park, with an internal bathroom, wood stove, lounge area and bedroom all connected in a secluded location. You could come to the National Park and stay in a hotel, but would be missing half the experience. Yellowstone Under Canvas offers all the amenities and services of a hotel, with a much lower environmental impact and a unique community feel. 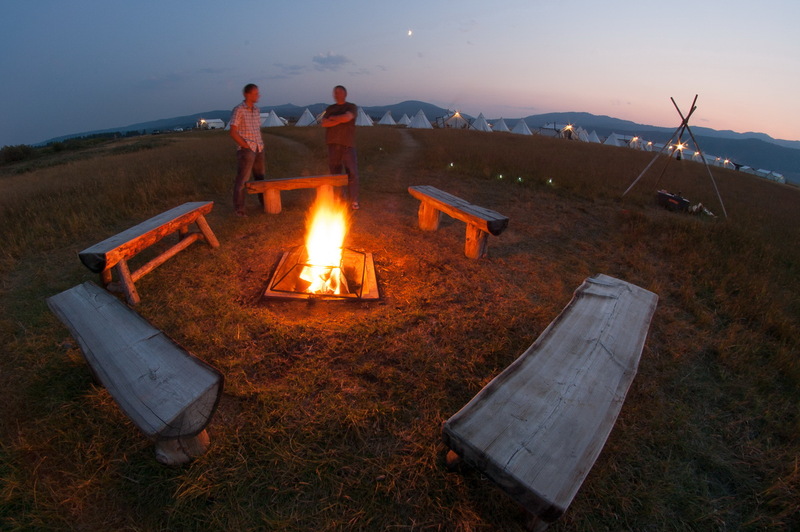 Nightly campfires offer guests an opportunity to tell stories of their day and connect with each other and our staff. 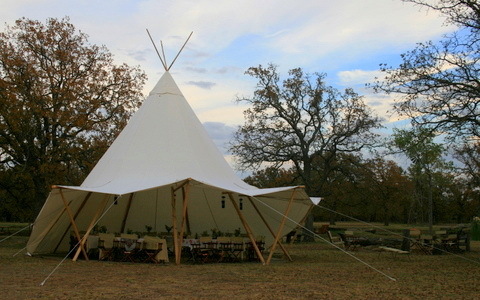 This summer we will add a unique tipi marquee space, available to be rented out by groups for reunions, corporate retreats and such. This is a new style of luxury accommodation. The wildlife and places that you’ll encounter in the Yellowstone region are remarkable, and there is something special about the space created by canvas –you just have to feel it. 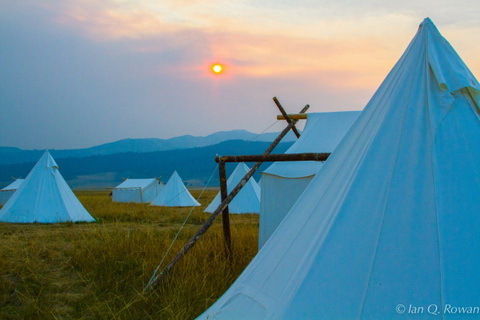 At Yellowstone Under Canvas you feel connected to the majesty outdoors. It’s almost a juxtaposition. 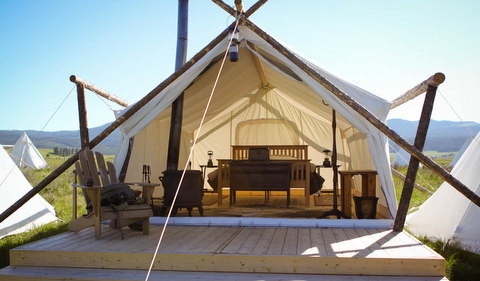 Who would have envisioned such luxury in one of the most gorgeous expanses of National Park and wild west backcountry. National Western Stock Show ~ Celebrating 107 Years!